Mount Bierstadt is the 38th highest 14er in Colorado at 14,060 feet. For perspective, it’s located in the Front Range a few miles east of Guanella Pass, in the northernmost part of the Pike National Forest. The peak was named for Albert Bierstadt, a famous western landscape artist who immortalized Bierstadt and the nearby Mount Evans in his paintings. The unique features of these peaks are two-fold; one can drive all the way to the top of Mt. Evans (making it a curious asterisk among the list of 14ers, along with Pikes Peak), and the fact the Evans and Bierstadt are connected by a treacherous ridge called the Sawtooth, a daunting route that some very confident climbers will attempt when summiting both peaks on the same outing. 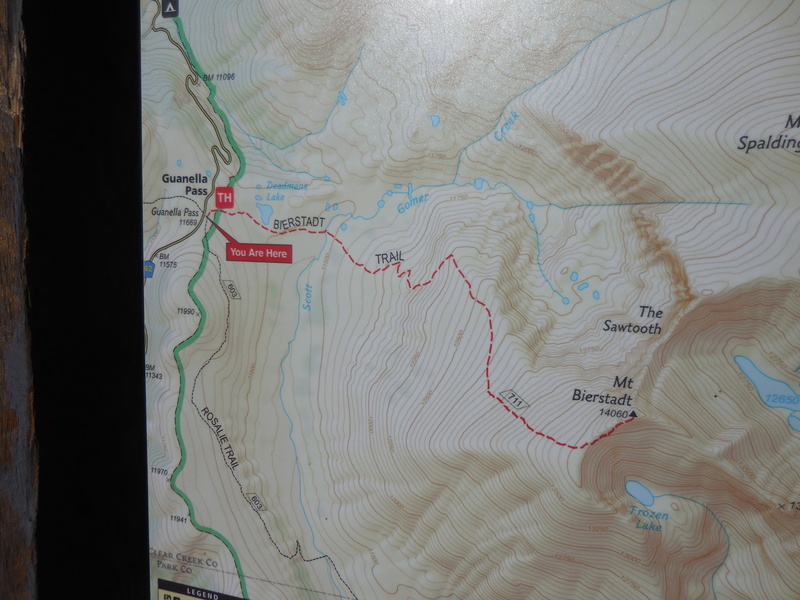 This description is for the West Slopes route which begins at the Guanella Pass Trailhead at the high point between Georgetown (from I-70) and Grant (from US 285) on CR 62. The paved roads leading to the trailhead, huge free parking lot, nice restrooms, great signage, and excellent trail for most of the way up, make this the most civilized 14er I’ve attempted, hence the name of this description. The first part of the hike is a pleasant, easy walk through a huge groove of wetland willows, some of which is on an elevated wooden walkway to avoid the mud. You soon reach the Scott Gomer Creek crossing and proceed through more willows, and mild switchbacks that give way eventually to more elevated, craggy terrain. The views are getting better with each switchback. The trail up to within 500 feet of the top is excellent, with lots of switchbacks straight up the ridge. About halfway up, the spectacular Sawtooth Ridge leading from Bierstadt to Evans comes into view. The best photos of the ridge will be had on the way down when the sun is at a better angle, but you begin to understand what makes this place so special. As you ascend, the air gets thinner, the views become more dramatic, the heart beats faster, and breathing become more labored. But, you eventually reach the ridge. The good news is that you have reached the ridge; the bad news is that the trail becomes a boulder scramble of the first order. Keep plugging and you’ll make it. The top is awesome. Check out the elevation marker, look for Mt. Evans to the east across the amazing Sawtooth, see if you can spot Long’s Peak to the north in Rocky Mountain NP, and look for Grays and Torreys Peaks which are clearly visible to the Northwest. Keep the marmots away from your food. The views once you get out of the huge wetland and at the top are magnificent in every direction. There are lots of opportunities for boulder scrambling, if you have the energy. Because of its proximity to Denver (and probably its relative ease compared to other 14ers), this is a very popular hike during the summer, so expect to see lots of friends at the top, especially on weekends. However, at the time of my arrival (on a Thursday), there were only 9-10 people on top and the trail didn’t feel crowded. This description does not cover Northwest Gully or East Ridge approaches to Bierstadt. The Northwest Gully is similar in difficulty but has a slightly higher exposure. The East Ridge involves a little more elevation but has big jump in difficulty and exposure. 14ers.com describes a third BIG option called the Combo Loop which involves submitting both Bierstadt and Evans, with a connecting trip across the Sawtooth; this sounds like a booger of a day and a challenge to experienced rock climbers. From I-70, turn south on CR 62 at Georgetown, also called Guanella Pass Rd., and drive 12 miles to the parking lot on your left at the pass. From US 285, turn north on CR 62, also called Geneva Rd., at Grant and drive 13 miles to the parking lot on your right. If the lot is full, overflow parking is available along the road.